Started in the year 2016, Edge, a homegrown brand launched by the Pune Freshery Co. delivers organic, cold-pressed juices to your doorstep within a time slot chosen by you. The cold pressed juices by Edge incorporates a technology that retains the core nutrients of the fruit or the vegetable, using zero or minimum amount of heat and air. The final product, thus, is very high on nutrition and live enzymes and contains no added preservatives or sugar. 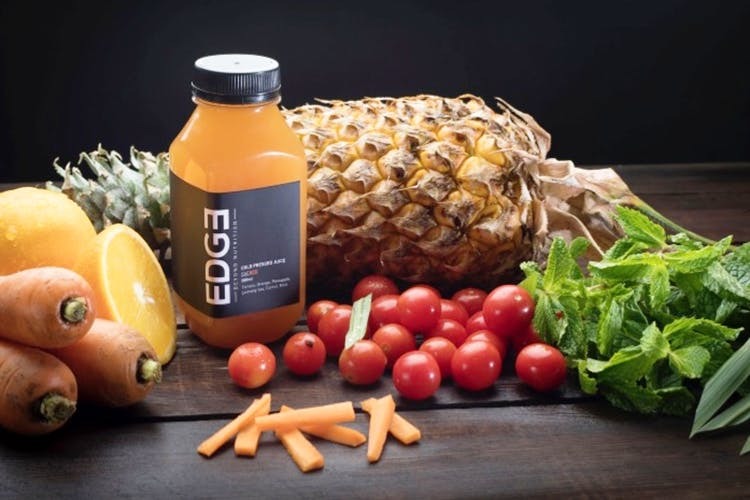 Edge offers three categories of juices – single flavour, blends and nut milk. Starting at INR 40, the nutritious watermelon and the pineapple juices are to die for! We highly recommend you try the blended juices, ranging between INR 60 and INR 160. Our favourite in the evergreen blend comprising spinach, parsley, bell pepper, tomatoes, mint, lemon, and cucumber. This drink aids in digestion, hair growth and helps in burning those extra calories. The sacred blend consisting of pineapple, oranges, lemongrass, mint, and tomatoes, is a great source of antioxidants and helps in reducing cholesterol levels. If you’re looking for a drink high in protein, go for Edge’s nut milk sans the dairy. We highly recommend you try the Nutchase, which is made out of almonds, cashews, dates, cinnamon and filtered H2O. High on anti-inflammatory properties, this drink helps in controlling blood sugar levels. What more? You can get your favourite Edge drink delivered at home. Price for monthly subscription starts at INR 2,700. Call on +919767670202 and place your order. For more details, follow their Facebook handle. Make a healthy choice today. Say no to the sugar laden commercial juices and opt for healthier natural substitutes by Edge.